In March 1941, at the age of nineteen, I joined the Gloucestershire Constabulary, but under the government scheme I was released to join HM Forces the following year. So on 15 October 1942 I joined the Army. After the Primary Training period, I was posted to the Royal Armoured Corps and, after more training, I joined the 13th/18th Royal Hussars (Queen Mary’s Own) at Wickham Market in Suffolk. Here I was to learn that the Regiment was to play an important role in the invasion of Europe. I was placed in the Recce Troop in HQ Squadron. My trade was driver/wireless operator, and I later became the driver and operator for the Regimental Technical Adjutant, Captain Lyon-Clark. A and B Squadrons were equipped with DD (Duplex Drive) floating tanks and C and HQ Squadrons had wading tanks. The DD tanks were to swim ashore after being dropped by their LCTs about 5000 yards from the beach. C and Headquarters Squadrons were to be unloaded from their LCTs by wading in deep water after being beached. After extensive training with the Royal Navy and our support infantry in England, Scotland and Wales, both on land and sea, including landings on various beaches, the next big job was to waterproof the vehicles. Every electrical point had to be covered with an asbestos compound and all grease removed and replaced with special salt water proof grease. By 3 June we were all aboard our tank landing craft. Mine was LCT 215, and the point of embarkation was Havant. We anchored off Portsmouth harbour at the ready. At midday on 4 June we were told there was to be a delay of 24 hours due to bad weather. At about 10pm we were issued with cans of self-heating soup and drinking chocolate – a real boon as we were very cramped on the landing craft. We set sail during the late afternoon of 5 June and I had to remain on wireless watch although there was strict radio silence in force. The seas were very rough and one had great difficulty keeping one’s feet. During the night our sealed orders were opened to discover where we were to land (I don’t think anyone was surprised). 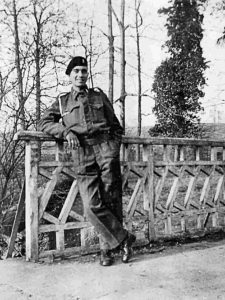 The Technical Adjutant was responsible for the well-being of the armour side of the Regiment and we were to see that all our floating tanks as far as possible were able to leave the beach, and then make our way east, harass the enemy and assist the 6th Airborne Division to hold the bridges over the River Orne and the Caen Canal. Looking around one could never imagine seeing so many craft of all shapes and sizes. We passed Empire Battleaxe, Empire Broadsword and Empire Cutlass to name but a few. By dawn we could see the coast of France, a great many gun flashes, smoke and fires. The battleships had opened up and the noise of the shells and explosions was terrific. All through the night Spitfires and Mustangs were flying overhead and occasionally diving to encourage the lads. Suddenly the order came from the naval commander; a crunching of metal as we beached and the ramp went down; all engines were revving and our time to disembark came. All I can remember is looking through three little slits, the water looking green and then we were ashore. Orders were to go full steam ahead and to stop for no one but to get off the beach. This was only a few hundred yards and it seemed that all hell had broken loose. There was a terrific clunk at the rear, which we later found to have been caused by an unexploded shell that must have been a ricochet. We finished up behind a sand dune and watched many of our floating tanks either knocked out or giving a good account of themselves and leaving the beach to carry out their next mission. The beach we landed on was SWORD Beach and we touched down around 7.30am. After our first job was finished we took off eastwards and despite many skirmishes we eventually reached the high ground overlooking the two bridges. We had passed through the landing area of the gliders and watched many coloured parachute drops of ammunition, etc. Unfortunately we had chosen a very exposed place and were pinned down until late afternoon but we could clearly see the gliders that had landed near and captured the bridges. We decided that we should remain popping away in case the Germans mounted a counter-attack. At this point we were called upon to retire towards the beach where we had landed as the Germans had indeed mounted a counter-attack and had all but reached the beach between Luc-sur-Mer and where we had landed. Whilst we didn’t see any Germans, there was enough noise, etc and the main problem was that our Regiment could have been split in two. Towards nightfall HQ Squadron decided to harbour near a little village called Hermanville-sur-Mer. So the ‘longest day’ drew to an end. We had lost a lot of tanks and men, but Rommel’s Atlantic Wall had been shattered. All I can remember is putting on the little petrol charger to top up the batteries, sitting down and leaning up against the vehicle tracks. When I awoke it was still dark, all was quiet and I could hear the dawn chorus; and my petrol charger had run out of petrol. The Technical Adjutant and I lasted until 18 July 1944 when we received a direct hit. Captain Lyon-Clark was killed outright, the quartermaster sergeant-major had his leg blown off and I received two broken legs and a broken right arm. X-rays showed I had at least twenty pieces of shrapnel in my body. But after nearly twelve months in hospital I returned to civvy street and my old job with the police – praise the Lord.